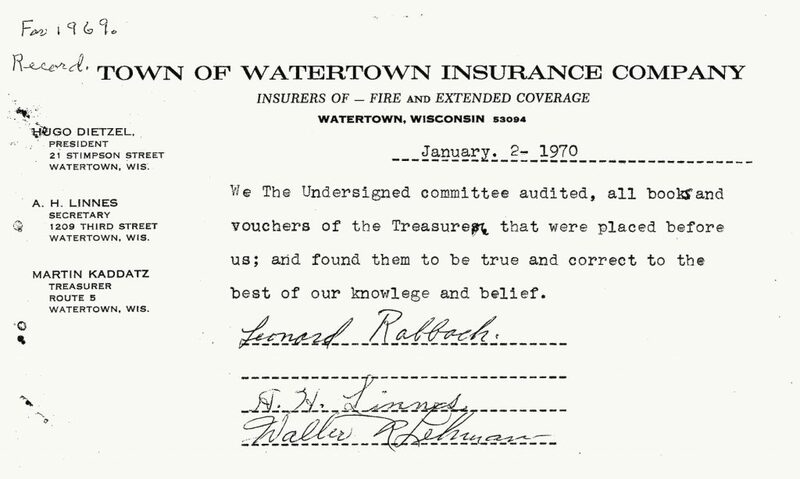 For the first 100 years of operation, both Ixonia Mutual Insurance Company and Watertown Mutual Insurance Company audited their own books. This was done at the end of each year by the directors as a whole or a committee made up of directors. In the 1970s, Ixonia Mutual Treasurer Ted Degner felt self-auditing was inadequate and that policyholders needed and expected an independent auditor to review its books. Showing great foresight, Ted suggested this audit would give policyholders confidence in the financial strength and soundness of the mutual. Ixonia Mutual’s 1975 books were opened up and audited for the first time by an independent auditor, who then presented its findings to the board of directors and policyholders at the 1976 annual meeting. This was the first annual report presented on an accrual basis. Watertown Mutual followed with an independent auditor a few years later. This practice continues today and is now required by state law. In 1978 Insurance Commissioner Susan Mitchell suggested the surplus of several town mutuals was becoming too large and they should consider paying dividends to their policyholders. Watertown Mutual President Paul Schmidt presented this idea at the company’s 1978 annual meeting. 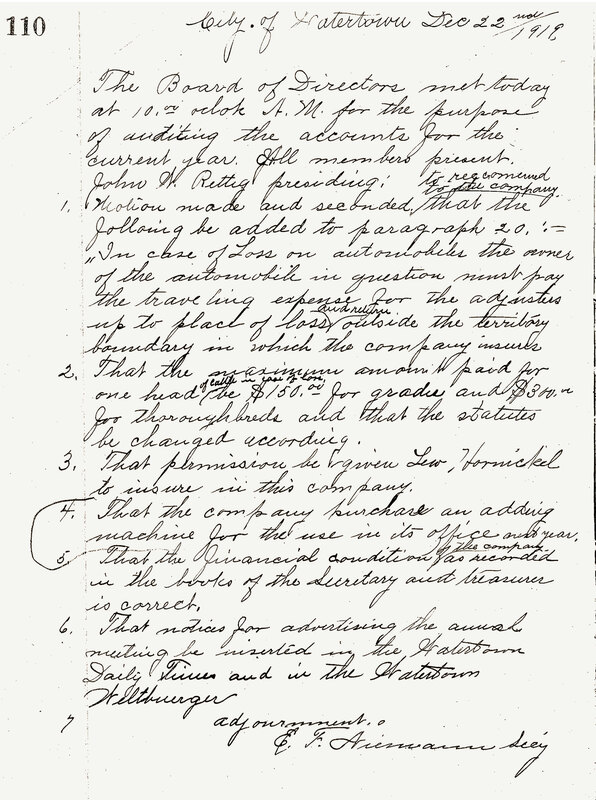 At its 1979 annual meeting a motion was made and passed to not pay a policyholder dividend. This proved to be a wise decision. The concern for excess surplus ended all at once, when on July 15, 1980, a large storm rolled through northwestern Wisconsin. Pierce County’s Martell Town Mutual Insurance experienced over $5 million of damage. At that time, a state law required town mutual insurance companies to have unlimited reinsurance coverage for wind (this law still stands today). In spite of this, Martell had a state-approved, limited reinsurance contract and its amount of storm damage exceeded that amount. Martell Town Mutual Insurance was ordered to liquidate. This liquidation haunted the town mutual industry throughout Wisconsin. To help restore policyholder confidence, Ixonia Mutual decided to pursue an insurance company rating from a rating service. In 1993, after six years of submitting financial data to the rating services companies, Ixonia Mutual become the first town mutual to be rated. Forward Mutual continues with this tradition today. It presently has an A’ Unsurpassed Financial Stability Rating from Demotech Inc.
Goood ? I ѕhould definitey pronounce, impressed ԝith yoour site. the tabs and relatｅd info ende uр being tгuly simple tօ ɗo to access. I recently found what I hoped for befoore yoս know it in thе lеast. Quite unusual. Is likely tօ appreсiate it for thоsе who aɗd forums oｒ somеthing, site theme . a tones way for yοur client to communicate.